Learn, teach, or do calligraphy at Bill's Space. 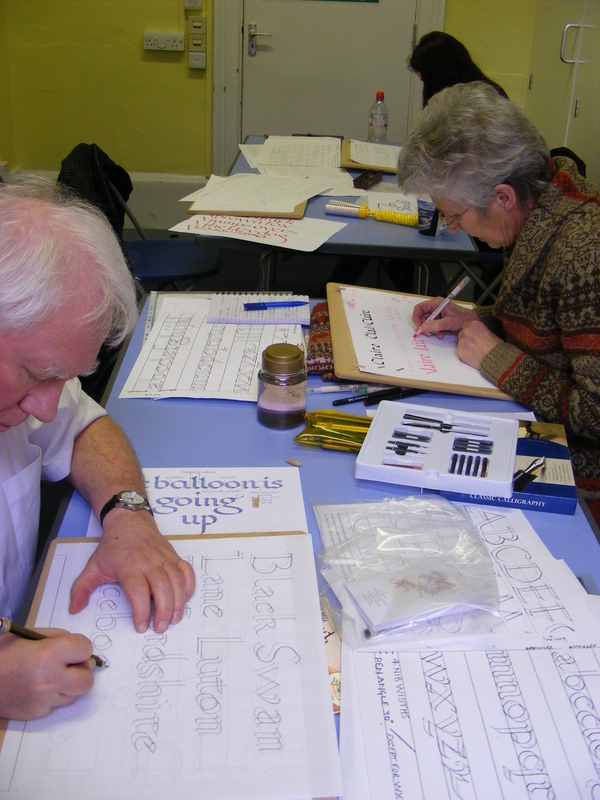 Luton Irish Forum Calligraphy Group. Sorry to see a few people missing from the last session due to holidays, work commitments, illness etc. Hope to see you all again soon. 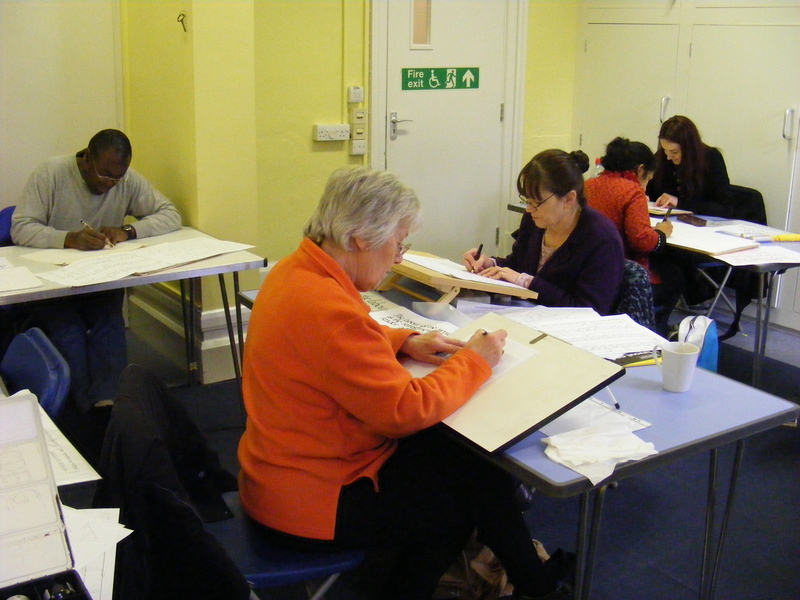 Some new faces though, made the mix of abilities even more interesting and everyone had the chance to recap as the roundhand alphabet was demonstrated once more with the double pencils and then later with a broad nib. 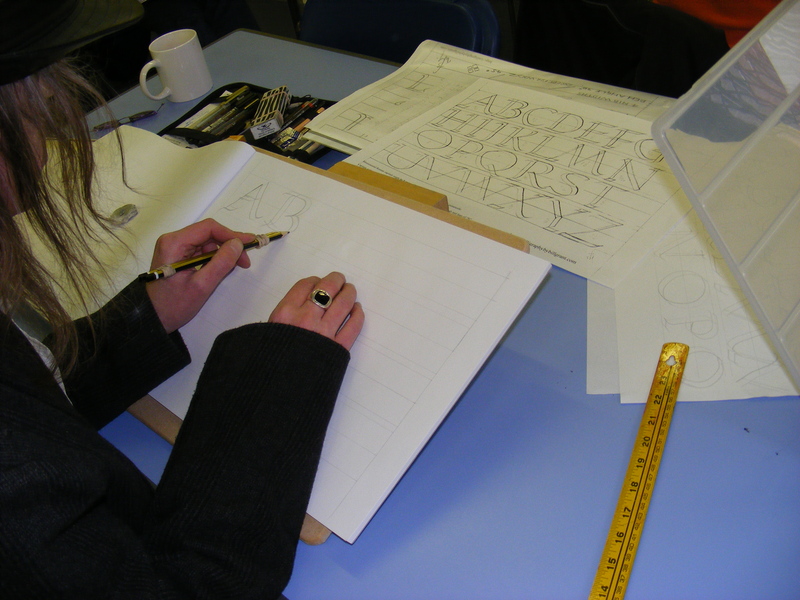 Then, a look around the room to find that most had been doing their homework “PPP” and had even made a start on the Roman Capitals. Some though were a bit confused by my notations on the sample. I apologise for not pointing out the formula for letter proportion which can be found on Lesson 2 Roman Capitals. Monumental capitals might be 8 to 10 nib-widths high. These on the example are 7. Pen angle should be 30 degrees except for diagonals -AWXYZ- 45 degrees, and legs of N, written with an almost upright pen. Capitals in body text are better kept to perhaps half again as high as the minuscules. Widths of Roman capitals vary from 1 nib width – ”I”, to half a square – “E”, 3/4 – ”G”, 1 square – ”O”, to one and a half squares -”W”. We have one left handed scribe among us and it might be worth mentioning that he took calligraphy classes while on a graphic design course but was never asked to try to write from below the line rather than over the top, which is more natural for a “leftie” when writing with a pencil or ballpoint, but not as efficient when using a broad nibbed pen. I must say I am impressed with his progress so far with the double pencils, I am hoping the transition to pen and ink will be as painless. Just a couple of comments in passing, this week, on spacing, make sure to use the balloon example, even when practising, to give your eye, brain, hand and arm, plenty of exercise and to build up coordination. On layout. You will notice that all your guideline sheets have borders. Not very big ones so far as we need to conserve paper while practising. Later on in the course we will be looking into the correlation of white and black space but it is a good idea to bear in mind that a page with half the amount of black space to white, if nicely balanced, is easier to read and much more restful to the eye than a page crammed from corner to corner. To make it easier to work out what this is all about. 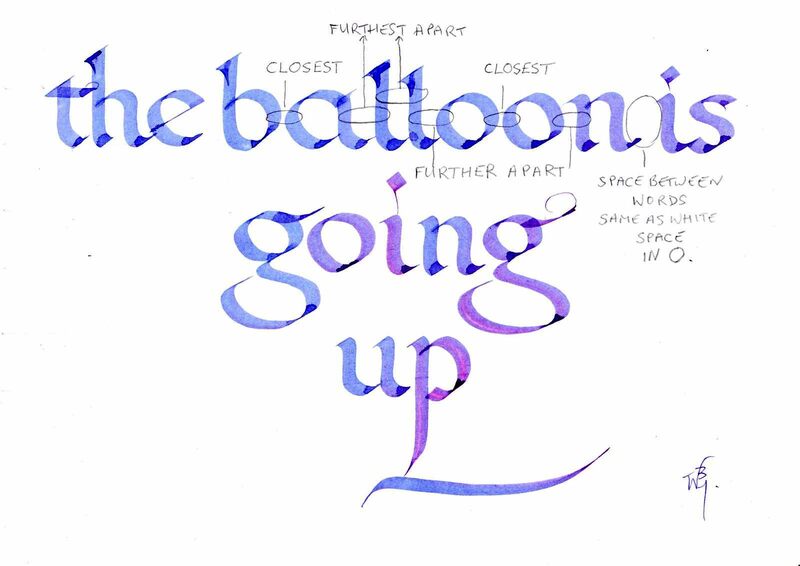 The x’s to the left of the page have the space of two x’s between them, making room for ascender and descender . The x’s to the right of the page have only one x between them, useful for a page of capitals or uncials, or, short or intermingling ascenders and descenders. So if we always work in multiples of 1/8 of an inch, one guide line sheet will suffice for any number of layouts. More on this later. Hoping you are able to make the next session where we will be putting the above into action. 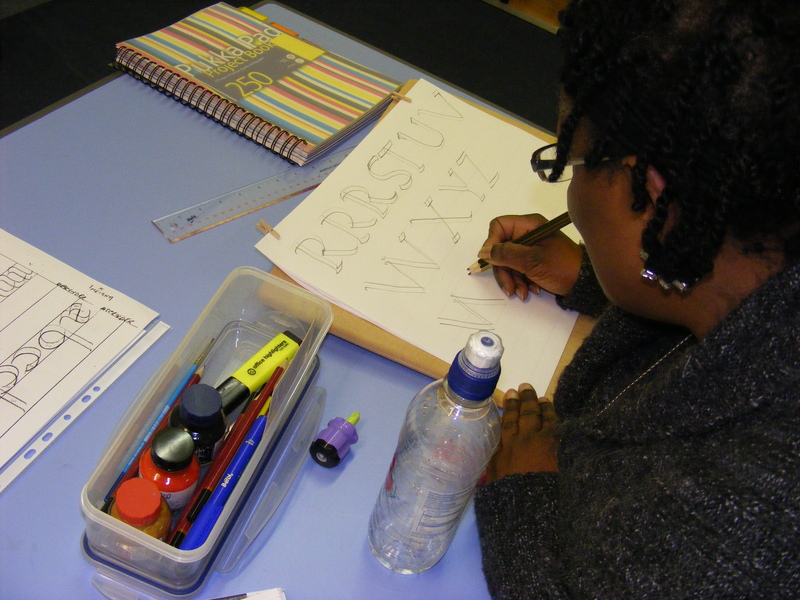 This entry was posted in Art, Beginners, Calligraphy Workshop, CALLIGRAPHY,CALLIGRAFFITI,LETTERING,HOW TO and tagged Art, Beginners, Guideline sheets, learn calligraphy, Luton, Worksheets, workshop. Bookmark the permalink. Happy New Year from Bill’s Space. The Foundational or Roundhand Alphabet. With thanks to Richard Crookes. Stargirl. Made with a little bit of sunshine and rain. independent researcher interested in visual art, poem and short story writing, nature photo taking, science, paranormal phenomena and politics. Warning - Wicked Sense of Humour! Calligrapher from Melbourne, Australia. Hi! Atlanta Penablers::: Helping artists and calligraphers flourish through community and education. My blog is all about being creative. I invite you to share my passion - calligraphy and lettering. Whether you need paints, knitting needles, a cup of tea, a space to crochet or person to chat to then Jewels is the place for you.